Perhaps it’s because of where I am in my ‘writing career’ but I thought Prose’s book was a complete ‘gift’… for the most part. For the past eighteen months I’ve been dissecting the books that I’ve read, rather than just reading them, rather like a furtive English Literature undergraduate. But here’s the thing, I studied English Literature to A level some 30 years ago. I flicked through Reading Like A Writer on a writing retreat, and wondered if Prose would be able to support my goals, and I think she has. I love Prose’s emphasis on slow reading, and the endeavour to read with a curious eye. Too often it is a temptation to scamper through the pages, but Prose encourages, and almost gives permission to indulge in the art of reading. 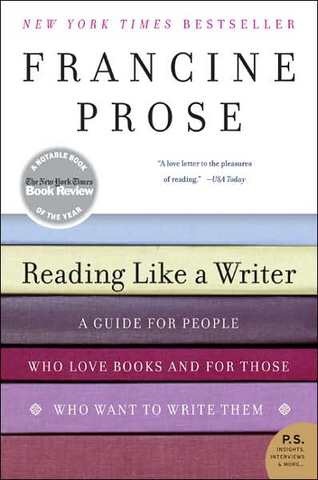 At times reading Reading Like A Writer felt like having a personal workshop – Prose’s writing in itself is light, engaging and thought-provoking. Her choice of examples was not always as fluid. At times the examples had me muttering ‘oh yes,’ but others were too long to be of real help, and that was a frustration. The early chapters I found to be the most helpful (except the one on paragraphs, which I took very little from) and the words/sentences chapters were inspiring on the craft of writing. Prose’s chapter on Chekov felt the most out of place – it felt more like a literary indulgence rather than reading – but I admit that I did find it absorbing. As a result, I am more curious to read Chekov’s short stories. Prose comes across as being a little snobbish. Her emphasis and tolerance is for literary works, and she is dismissive of great swathes of genres. I find this a little tough, as personally, I think there is room for all kinds of books for all kinds of people. Overall I found Reading Like A Writer to be helpful and inspiring. Prose ends with a ‘go and read list’, which is daunting, and a little shaming! I clearly have some way to go before I could sit at her feet and discuss books! That said, I am certain that I will invite her along in my work as I develop further. I recommend this book to anyone who wants to read like a writer, and hasn’t come from an English Literature background.